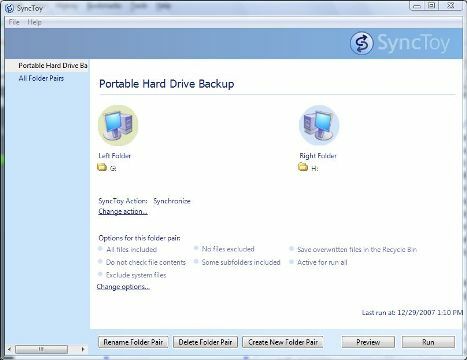 SyncToy is a free synchronization software utility for Windows which helps users to copy, move, rename, and delete files between folders on local or remote computers and mobile or portable devices such as digital cameras, cell phones, portable media players, camcorders, PDAs, and laptops. SyncToy 2.0 is an upgrade from SyncToy 1.4 which enhances the application with a redesigned sync engine for better performance and scalability. SyncToy v2.0 is currently in beta. Sub-folder Exclusion Enhancements: Descendants creates under excluded sub-folders are automatically excluded. Folder Pair Metadata Moved: Folder pair metadata removed from My Documents to resolve any issues with server-based folder pair re-direction setup. SyncToy 2.0 requires Microsoft .NET Framework v2.0 to run. Download SyncToy 2.0 or directly download SyncToySetup.exe (no longer available) from Microsoft Download Center. For users who interested to know more information about SyncToy 2.0 such as benefits for photographers, how to use SyncToy, how SyncToy works and its limitations, download and read the SyncToy 2.0 white paper (no longer available).